A Battle Against a Beast... Infantile Spasms and Epilepsy Awareness. I created this video yesterday in recognition of Purple Day, a grassroots effort to increase epilepsy awareness worldwide. Those who have experience with a seizure disorder like Danielle's know that this is a tiny part of our story. Trialing drugs is like a guessing game. Research is so badly needed. There are children struggling with a catastrophic seizure disorder that threatens to rob them of everything. New research could release them of the clutches of a beast. We dont know yet how Danielle's story ends, but I pray for her everday, as well as everyone else that has struggled with epilepsy. It it's been laid on your heart to get involved, here are some ways that you can help. IDSC for life quoted me today, in a compilation of accounts from families about how they received their child's Down syndrome diagnosis. "The pediatrician said almost nothing. My OB was an absolute blessing. She said Danielle would get through the gates of heaven. She said she'd get me there too. She said Danielle would be strong for me and she'd make me stronger too. She cried tears of joy for us. She said we had been very blessed. I could see that she was genuinely happy for us. None of it really made sense to me at the time, but now just over a year later I totally "get it." I'm so thankful for her. I think she helped to shape my view and started me off on the road to acceptance." 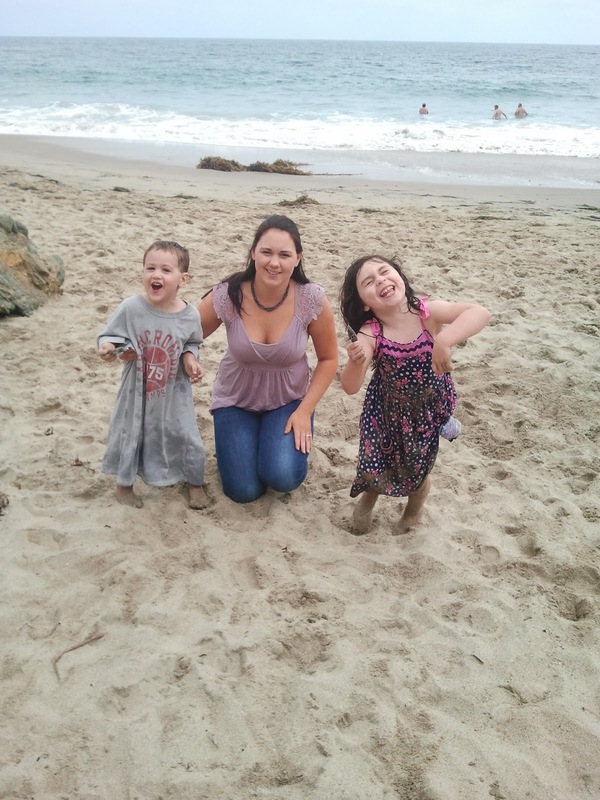 I've been wanting for a long time to write more about our experience with a post-natal diagnosis. I believe these few moments after our youngest daughter was born were incredibly pivotal in my life, and the doctor who delivered her made an amazing impact on me. I'll never forget what she said in those moments after Danielle was born, I replay her words in my head and they become more true as we learn and grow together; but it wasn't her words that made the biggest impact on me. It was her congratulations. It was her joy. She was truly and genuinely happy for us. I felt comfort in that she had no sorrow or pity for us. "Mothers want to be with their babies...especially when they are sick. It's the natural thing to do. Whether a person lives 25 minutes, 25 years or longer, none of us knows prospectively the contribution any given person will make to humanity. So we treat each baby and Mom with the dignity they deserve, and we pray... a lot. In this process, the parents bond with their child. They share fully in their child's short life and experience their death. They realize what a joy it is for a person to spend his or her entire life within another, surrounded by love, never having committed a sin, never wanting for anything. The experience provides a firm foundation for closure with the death of their child. It brings at least some level of a positive experience from a tragic situation. It facilitates the grieving process, and makes it more likely to be fruitful...so the family can find peace. Each time I accompany someone on this journey, I am reminded just how precious life is. It is truly a gift." -Dr. Marie Anderson, Tepeyac Family Center. Life. A gift. Down syndrome is compatible with life... with good life... full life. I understand now why Doctor Anderson was not mournful for us when we received a Down syndrome diagnosis. She knows mourning. She knows suffering. She knows tragedy. 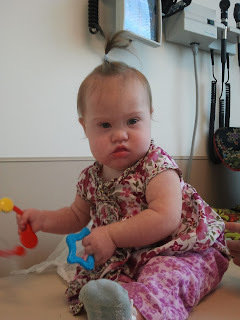 She knows Down syndrome is not a diagnosis that warrants these things. We were blessed with the life of a child. We are blessed to grow with this child, to hold her and love her and enjoy her. We are blessed to see her first smiles and listen to the giggles she shares with her siblings. We are blessed to have the honor of raising her, even as we are sometimes faced with adversity. We are blessed with the overwhelming pride in her accomplishments. We are blessed with the joy of watching her blossom in to the person she is meant to be. We are blessed with a future that we can look forward to with our daughter. She has been given to us to guide her as she lives her life by the Lord. She is a gift that we will cherish for as long as we are blessed to have her. I attended my first annual Marine Corps birthday ball with my husband in 2003. After a while, it can start to feel like a huge chore to prepare for. Every year I have to shop for a new dress, not because I want a new dress, but because none of the five that are hanging in my closet are my size this year. The new dress will need to be tailored because I’m not a 6 foot tall supermodel. Of course my nails have to be manicured, and I like to try to color the gray out of my hair. My mascara always seems to be dried out, and that’s just not a good look, so I’ll need to remember to hit the cosmetics counter at some point. I will need to find a sitter for the kids and draft a plan for the night to include meal instructions, bedtime routines, and tantrum aversion techniques. It always breaks my heart to see my babies cry as mom and dad leave the house and I can’t relax and enjoy the evening until I know they’re happy and tucked in to bed, so I text back and forth with the babysitter though the evening. I don’t always have a sitter that I can call on, though. I’ve had my mom fly in to babysit (thanks mom!) because we hadn’t yet settled in enough at our new assignment to know someone that I would trust to leave my children with. I’ve been to birthday balls while pregnant, and I’ve had to excuse myself to nurse a baby who is sleeping in a near-by hotel room. We’ve traveled hundreds of miles for “destination balls” in casinos, which is really fun when you’re young and have no kids, but not so much when you’ve got to cram your post-pregnancy-body in to the tight space between the car seats of your 2 year old and three month old and attempt to entertain them for hours on end. Needless to say, most years, by the time we’re off to the ball I’m feeling flustered after rushing out the door, and tired from all the preparation it took to get everything in to place. But then I get a good look at my handsome Marine. There’s nothing like a man in uniform, and this uniform, graced only by the Marines, is the best looking uniform there is. We sit down around a table amongst Marines in their “dress blues”, and I’m reminded what we’re there for. It makes me proud to support my husband and all Marines as they celebrate their rich culture and history. It’s inspiring to see the magnitude of respect they have for their Corps, and the way they embrace the core values and traditions that have been passed down from generation to generation. I pulled out a gown from my closet this morning, tried it on, and cried a few tears of regret that we won’t make it to the ball this year. I hope that at least one more time, before my husband’s Marine Corps career comes to an end, I’ll have the honor of accompanying my Marine to the ball. There is nowhere else that I feel as proud as I do on the arm of my decorated Marine Officer. Instead of wallowing tonight about missing our birthday ball, I’m giving thanks that I have my Marine home with me. I’m thankful that he’s here to kiss our kids goodnight and that when I go downstairs after putting them to bed we’ll sit together to watch T.V. He’ll be next to me in bed as the sun rises, when two in the bed becomes five. Tonight I’m thinking of the Marines who are away from home and their families who await their return. We are so fortunate to have them protecting our freedom so fiercely, and I'm praying for their safe return home. Happy 237th birthday Marines! This is who you hurt when you use the word retard. I'm not going to write an open letter to Ann Coulter about how wrong she is for this. She knows it's wrong to degrade a whole group of people, deem them worthless, and disregard them completely as she litters the Internet with hateful slurs; but she doesn't care. Even if my tiny little blog did somehow reach her, it wouldn't matter. I don't have a very long reach. My readers are mostly my friends, my family, neighbors, and acquaintances. Good people who, unlike Anne Coulter, have a moral compass. Yes, good people. People who wouldn't intentionally cause harm to another. People who certainly wouldn't throw stones at someone who was defenseless. But you see, sometimes we don't realize that, even without intention, we can cause harm to another. We can leave scars. We can perpetuate an awful injustice that so badly needs to stop. I may have a few times during my years casually used the word "retarded." "I can't believe I have to pay this much for new tires on my car; they're made of rubber, that's so retarded." I wasn't aiming to hurt anyone. I would never actually call someone a "retard", or use the word to diminish someone. I am more sensitive to the word now that I am the mother of a child with Down syndrome, and I'm a better person thanks to that. "Retard" is a word that hurts. It's a word that generalizes a whole group of people. It's a word that carries forward a stigma that limits people who have shown themselves to be capable of much more than had once been expected from them. Our society has come up with nasty names to disgrace just about every "group" of people there is, whether it be race, sexual orientation, social economic status, etc... there's a slur to label you with. Most of them, however, are not socially accepted. They're considered to be discriminatory. Why then, do we accept the word "retard" to be thrown around like it is? Carelessly spoken between friends in line at the coffee shop, plastered on friends' Facebook walls, Tweeted, spewed all over television, the movie theatres, and radio? Why do we allow this word in our vocabulary? Why do we allow it in our homes? In the schools that our impressionable children attend? Please don't casually use the word "retard" as slang. It should not be socially acceptable in any context other than it's medical use. If it's casual use is no longer accepted, than surely, when an awful excuse for a human, like Anne Coulter uses the word in the manner she did, she'd undoubtedly be knocked right off her platform for her offensive behavior. Do you think if she used the N-word, she'd get away with it? No way! That would be totally unacceptable, the network she works for would step in and shut down the offensive behavior. The R-word is just as hateful, and should not be tolerated in a public forum. Anne Coulter, here is the person you are trampling over. The person who you have declared is less than you. Here she is as she basks in the glory of a beautiful fall day, rolling joyfully in the grass. She is an innocent child who deserves to grow up in a world that values her life, where she'll be treated with decency, and allowed to blossom to her full potential without the threat of someone like you carelessly stepping on her. I talk about Down syndrome a lot, well especially in October, I have good reason for that, being that it’s Down syndrome awareness month. 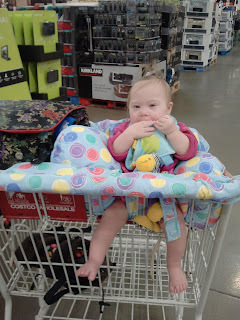 You might think that my life is consumed with Down syndrome, but please, don’t be mistaken. 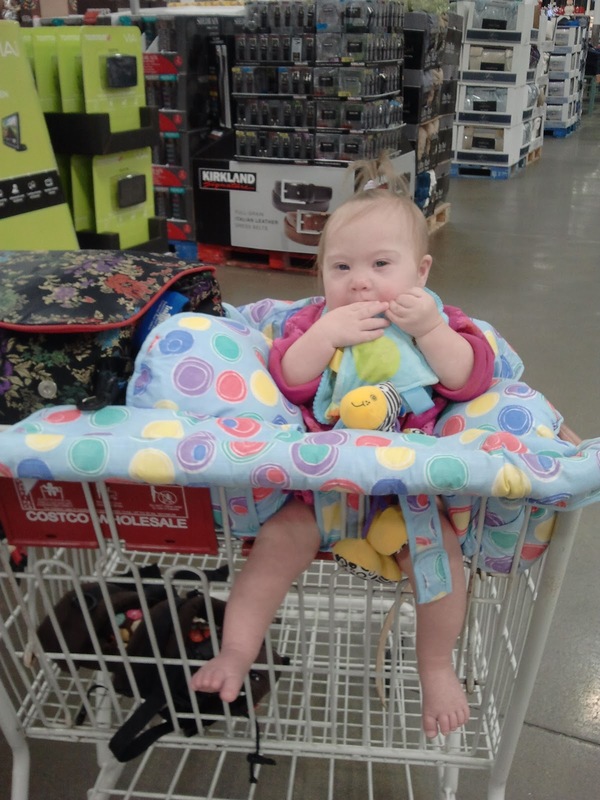 My life is not consumed with Down syndrome. My life is consumed with my love for my family (well, there's the never-ending laundry and dishes too, I often feel like they consume me.) We spend our days doing “normal” family stuff. They were NOT supposed to get wet! Life isn’t perfect. It wasn’t perfect before Danielle and it isn’t perfect after. She, however, IS perfect, and life IS good, really good. Her cuddles will be heavenly. She will trust you with the weight of her whole body, and with complete abandon she will drift to sleep in your arms. As she exhales in to slumber it will feel like angels breath on your skin. You will be completely and helplessly enveloped in the love you have for your child. 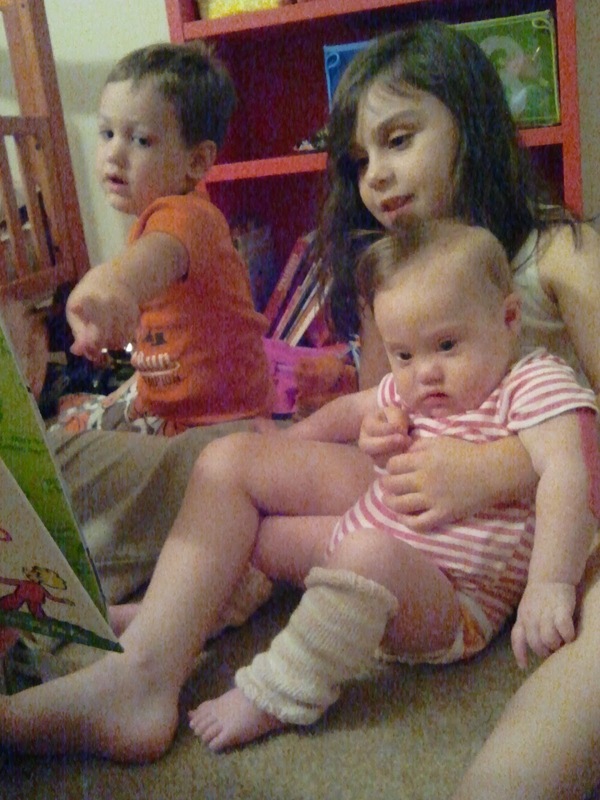 Her siblings will cherish her. The sound of the giggles they will share will reach in to your soul. It will heal wounds that have been there too long. She will strengthen your faith and your values. She will be the easiest of your three children. She'll be joyful. She'll be patient and forgiving. She will adore her family. She will be fill to the brim with so many things that are good. Daily life won’t change much. She will be adorable. Perfect strangers will stop to ogle over her. She will teach you more about life than you could ever hope to teach her, or any of your children, for that matter. Her entry in to your world will be a life changing experience, a gift that not everyone is lucky enough to have been given. She'll strengthen your character and give you more purpose in your life. She'll inspire you to be an advocate. With this child, is an opportunity to rise to the occasion, but you won't have to reach for the stars, because they have been given to you in her. We totally hit the jack pot! FACT: All people with Down syndrome experience cognitive delays, but the effect is usually mild to moderate and is not indicative of the many strengths and talents that each individual possesses. I love this message from IDSC for Life. My girl IS pretty happy, though. I tell her all the time that God filled her chock full of joy. FACT: The average life expectancy of an individual with Down syndrome is now 50 years of age. Life expectancy has continued to improve dramatically over the years and will continue to improve with medical science advances. "Mommy, I want to take Danielle to school for show and tell. I want to share her with everyone. "- My oldest daughter. Me too, baby girl... me too. I want to share her with the whole world. 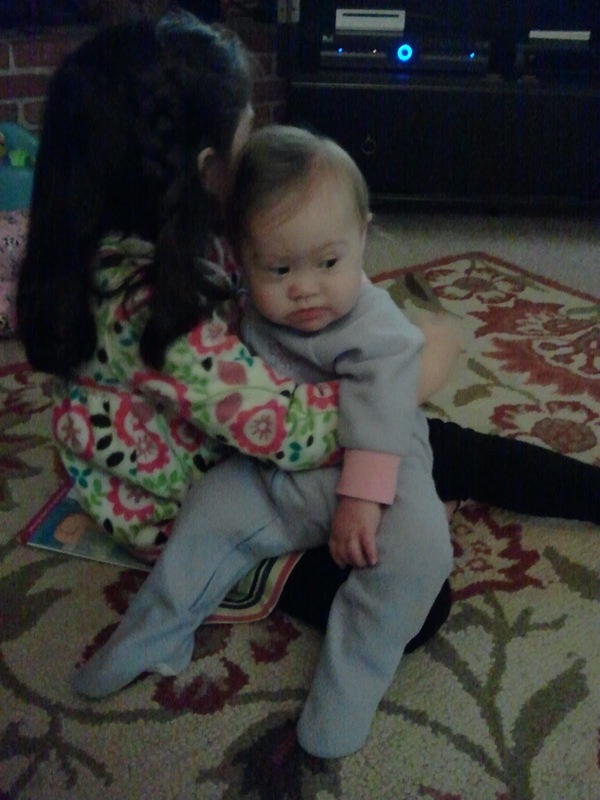 I want to tell people that regardless of what they may or may not know about Down Syndrome, that she is an amazing gift. I want to tell them that her life is valuable. I want to tell them that she is capable. I want to tell them that she makes me proud every day. I want them to know that I have hopes and dreams for her and that I believe whole-heartedly in her potential. 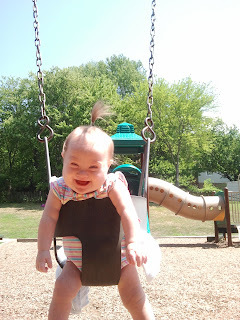 Most of all, I want to tell people that Down Syndrome is not who she is. She does not suffer from Down Syndrome. 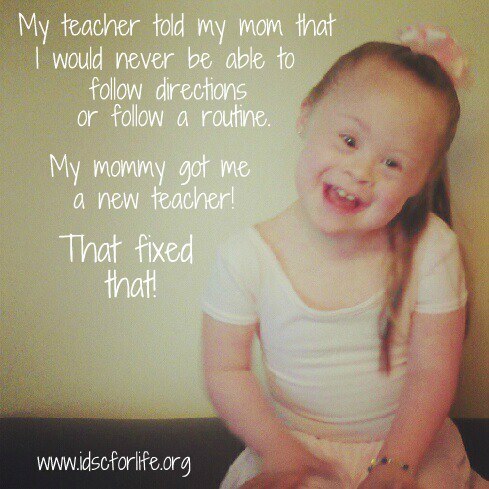 She is not defined by Down Syndrome. She's a daughter, a sister, a niece, a cousin, a grand daughter. She is a sweet one year old girl. She is an individual. She has a blossoming personality that is all her own, and just like anyone else, she deserves to be loved. She deserves to be respected as a member of our society. She deserves to be recognized by her teachers as a student with potential. 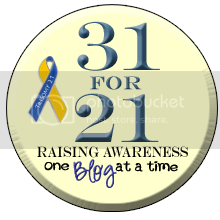 Today, October 1st, kicks off Down Syndrome Awareness month, and I'm participating in 31 for 21. It's a blog challenge. 31 days of October, 3 copies of the 21st chromosome. 31 for 21. Raising awareness. Danielle was born in September last year. I was pulling my head out from the mud just in time for Down Syndrome awareness month, Buddy Walk, and 31 for 21. I was just learning about Down Syndrome, and lucky for me, the Internet was flooded with information about the genetic condition. It wasn't anything like the outdated pamphlet that was given to me at the NICU though. It was the best information available. Straight from the real experts, the parents, siblings and friends of people with Down Syndrome. I learned about people first language, debunked myths and stigmas that I had associated with Down Syndrome, and noted the real facts. 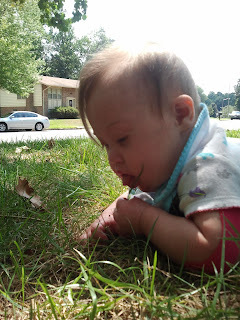 I related to more personal posts about things like faith, and was privileged to experience what daily life was like in a family with a child of Down Syndrome. I believe this flood of information was pivotal for me in the embrace of my child's diagnosis. I was inspired to be an advocate for my daughter and others who are rocking their 47 chromosomes. I don't know if I'll be able to post every day, but I'll give it a try! I would really like for my friends and family to follow my blog this month. It's important to me. Read the posts, please! Thank you all for the overwhelming support in our fundraising effort. Please consider joining our Buddy Walk team, if you haven't already. It was one year ago tonight that we brought our sweet Danielle home from the hospital. We celebrated her first birthday on the 7th of September, but I feel like this day deserves a celebration all its own. It was almost immediately after our daughter was born that she was taken to the Neonatal Intensive Care Unit for oxygen support. Before they took her from the delivery room, a doctor told us he thought she might have Down syndrome. I had already recognized her facial features and I knew it was true. It seemed like forever before the doctors were finally able to move me from the delivery room. I was anxiously waiting to be reunited with my brand new baby that I had only barely had a chance to hold; but when I got to her room I found myself at a loss. She was in an warming bed, with an oxygen hood that completely covered her face and head. I couldn’t hold her. I couldn’t nurse her. I couldn’t sway to a rhythm with her in my arms as I shushed her in a soft soothing voice. I couldn’t comfort her in any of the ways I knew how. I didn’t know how to be her mother; that’s how I felt, anyway. I laid my head down helplessly on the edge of her bed and held her tiny finger. My mind was swirling with concern and fear. It wasn't long before I asked to be taken to my room. I was exhausted, mentally and physically exhausted. Later in the evening my nurse asked if I wanted her to take me back to Danielle’s room. I agreed, but mostly only because I didn’t want the nurse to think I was an awful person for not wanting to see my baby. It was hard to see her under that hood with so many things attached to her and to feel like I couldn’t be her mother; or didn’t want to be. I was struggling with so many difficult emotions. The next day the nurse removed the hood that covered her face and replaced it with a nasal cannula. I was able to hold her. It was so nice to cradle her in my arms and rock with her in a chair. It wasn’t long after that the doctor gave the go ahead to try feeding. It was an awesome feeling to provide her the nourishment that only her mother could. My mind was starting to clear a little and I could feel my baby tugging at my heart. I started to notice that her nose looked just like mine, and that the way her eyes slanted slightly upward was graceful and pretty. Her fingernails were so tiny and the blond peach-fuzz that covered her body was sweet. I was discharged from the hospital and went home to see my other kids. Over the next few days I was back and forth from the hospital to home. Every day I was missing her more. When I held her my worries left me for a while. The smell of a newborn brings a flood of mothering instinct. Her soft skin was warm against mine, and her eyes seemed to tell me everything was going to be just fine. By the 16th of September, Danielle had been off the oxygen support for a few days and she was doing great. 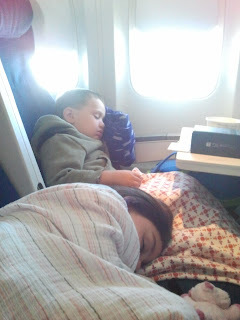 Her doctor said we could bring our baby home. While the shock of her diagnosis was not as raw as it had been a week before, it was still hard to accept. It was hard to think about how her future might not be exactly like the one I had thought of during the 10 months that I carried her in the womb. It was hard to explain to our family and friends what had happened, and attempt to console them when I myself needed to be consoled. It was hard to feel the pressure to be a “special” parent that so many had said that I was meant to be. It wasn’t hard to love her, though. That part was easy. We brought our baby girl home and we loved her. We enjoyed her. Our scars were beginning to heal as we adored every coo, celebrated her first smile, and enthusiastically applauded her first time rolling over. It was the day we welcomed her in to our home that she changed my heart. I could see how perfectly our baby fit in to our lives. I was seeing my child for who she was. She was a baby, a precious blessing, not a diagnosis. Love is the only thing I needed to be her mother. It’s now one year later and I am incredibly proud of our daughter. I want to shout from the roof-tops that I love someone with Down syndrome and that she has forever changed me. I’ve learned so much from being her mom and she’s made me a better person. I still have hard days sometimes but her eyes are still telling me that everything is going to be OK, and her infectious smile seals the deal. Will you shout from the rooftops with me? 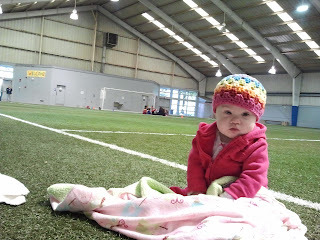 Join us for Buddy Walk to celebrate Danielle’s first birthday! I'm a proud Marine Spouse and Mother to three beautiful children.